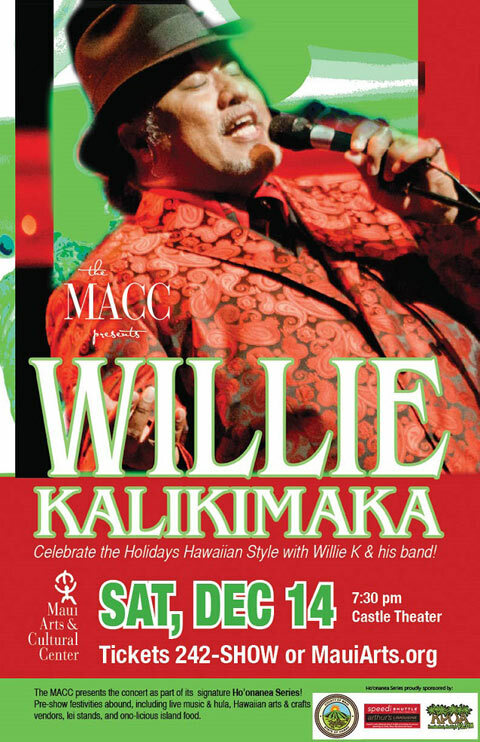 If you are lucky enough to be on Maui during the Christmas season, a don’t miss event is Willie K’s annual Christmas concert. We attended last night’s event at the Maui Arts and Culture Center and were treated to a truly unique Hawaiian Christmas experience. The night opened with several traditional Hawaiian tunes by Uncle Richard Ho`opi`i, including a lovely hula by his wife Ululani. Willie entered the stage by joining Uncle Richard for his final song. I was so impressed with Willie’s obvious respect and appreciation for the older generation of singers. Willie is an amazing guitarist and entertainer, and an even more amazing vocalist. In his own words, he likes to go “against the grain” and all of his songs are “Willie K style”. My favorite song was Ave Maria, complete with outstanding operatic vocals. My second favorite song was his impression of Willie Nelson singing Away in a Manage. Yes, Willie K mixes it up, even at a Christmas concert he works in traditional Hawaiian, blues, rock, opera, country, and incredible mixtures of all of the above. Tickets for this Christmas show on Maui can be a bit spendy, but worth every penny. P.S See my previous post for more ideas on things to do on Maui during the Christmas season. And don’t forget to leave comments with your own ideas for Hawaiian holiday activities! This entry was posted in Uncategorized and tagged Christmas, Hawaii, Holidays, Maui, music, Willie K by davekresta. Bookmark the permalink.